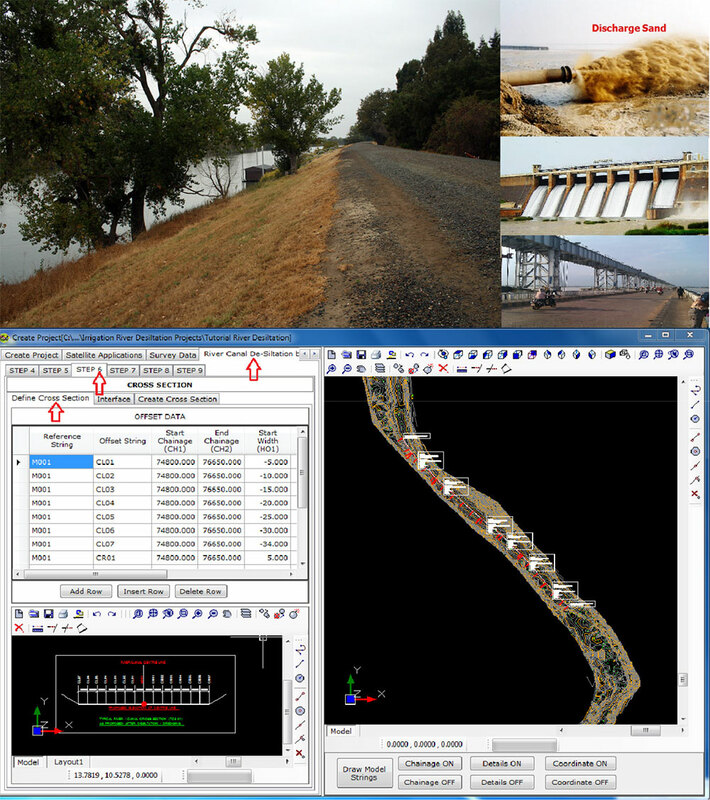 HEADS Site – Irrigation is CAD based software and HEADS Site has wide range of applications in Irrigation projects design of Canals, Bunds, Dykes, De-Siltation Dredging work. It can also measure Volume of Storage water in a reservoir at Dam or Barrage by recording rise or fall of water levels by using Digital Terrain Model & Contours generated by using downloaded Ground Elevation data obtained from Shuttle Radar Topography Mission (SRTM) by Global Mapper from the satellite, without any field survey work. The Slope Stability Analysis provided by Bishop's method. It handles various Survey data, DTM, Triangulation, Contour, Satellite images, Conversion from TM (Survey) to UTM (GPS) Coordinates, Communication with Google Earth to plan for Bypass and Green Field Bypass Alignments, Use of Ground elevation data by Online downloading from Shuttle Radar Topography Mission (SRTM) from Internet without any Field Topo Survey, Alignment Geometric design for Road / Canal / Bund / Dyke , Traversing with closing error corrections by Bowditch, Transit, Closed Link, EDM, Ground Sections in CAD Drawings. HEADS Site – Irrigation is also useful for maintaining and retrieving Land Data Records with various details useful for Land Acquisition and Information purposes. The Land Map drawings are maintained with in-built CAD system and Land records are maintained by using Microsoft Access Database Management System by making drawings & records inter-connected. HEADS Site – Irrigation has full range of applications for Site Leveling/Grading projects, Earthwork quantity estimation for Cut & Fill, Mass Haul Diagram, Design of Construction platforms etc. HEADS Site – Irrigation has full range of applications in Road Engineering applications which is useful for design and construction of inspection roads, and subsequent estimation for Bill of Quantity and Cost. The softwares generate detail Step wise Design report and sophisticated CAD drawings for construction purposes. HEADS Site – Irrigation has facilities in design for Water distribution Pipe Network with output showing Pipe wise Diameter, Discharge, Pressure Heads at nodal points with DisNet program supplied along with.